New European Union rules come into force today banning hundreds of traditional herbal remedies. 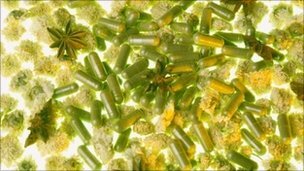 The EU law aims to protect consumers from possible damaging side-effects of over-the-counter herbal medicines. For the first time, new regulations will allow only long-established and quality-controlled medicines to be sold. But both herbal remedy practitioners and manufacturers fear they could be forced out of business. To date, the industry has been covered by the 1968 Medicines Act, drawn up when only a handful of herbal remedies were available and the number of herbal practitioners was very small. But surveys show that around a quarter of all adults in the UK have used a herbal medicine in the past two years, mostly bought over the counter in health food shops and pharmacies. The regulations will cover widely used products such as echinacea, St John’s Wort and valerian, as well as traditional Chinese and Indian medicines. But safety concerns have focused on the powerful effects of some herbal remedies, as well as the way they interact with conventional drugs. For example, St John’s Wort can interfere with the contraceptive pill, while ginkgo and ginseng are known to have a similar effect to the blood-thinning drug warfarin. From now on only products that have been assessed by the Medicine and Healthcare products Regulatory Agency (MHRA) will be allowed to go on sale. Manufacturers will have to prove that their products have been made to strict standards and contain a consistent and clearly marked dose. And to count as a traditional medicine, products must have been in use for the past 30 years, including 15 years within the EU. They will also only be approved for minor ailments like coughs and colds, muscular aches and pains, or sleep problems. Remedies already on sale will be allowed to stay on the shelves until they reach their expiry date. Richard Woodfield, head of herbal medicine policy at the MHRA, says so far there have been 211 applications, of which 105 have been granted registration. “Crucially, this EU directive and the registration scheme puts consumers in the driving seat so they can identify that a product meets assured standards on safety, quality and information about safe use. “Safety speaks for itself, but quality means, are they using the right part of the plant? Is it free from contamination? Is the claimed shelf life suitable? And that is a key point for the Royal Pharmaceutical Society, which believes the new regime is a step forward in improving safety and quality. But Prof Jayne Lawrence, chief science adviser to the society, says there are still some concerns about herbal products. “They certainly haven’t been tested on the same basis as a conventional medicine and some of these compounds are very potent. “Patients might not realise that in some cases they should not take other medicines with them, or if they’re going for surgery they should tell their doctors they are taking these particular medicines because there may be complications. The manufacturers of herbal remedies have had seven years to prepare for the new rules after the European Directive on Traditional Herbal Medicinal Products was introduced in 2004. These regulations apply to over-the-counter sales, which form the bulk of herbal remedies sold in the UK. But some manufacturers and herbal practitioners have expressed concern, arguing the new rules are too onerous for many small producers. Michael McIntyre, chairman of the European Herbal and Traditional Medicines Practitioners Association, says there will be a significant impact on herbal medicine practitioners and their suppliers, but admits the rules do need bringing up to date. “Products that go on the market now will definitely do what it says on the bottle, while we didn’t know how good they were in the past. “But registration is expensive so perhaps there may be fewer products on the market and a smaller range.